Yep. I have a man's name. I was mailed Boy's Life magazine as a kid. I'm often referred to as Mr. in emails and letters. Personalized "Jamie" items are always blue and weapons. So in honor of my name being ambiguous, there's a giveaway. Feel free to elaborate on why you like it. Or not so much. Or how you ended up with it. 2. Be a follower of Jamie's Rabbits on Twitter. Important Details: Open to anyone in the US. Must enter before 11:59pm CST on Monday, August 23 to qualify. Winner will be chosen randomly using Research Randomizer and announced on Tuesday. Obviously, anonymous folks can't win unless they leave a name in the comment. P.S. Amazon tracks my every move, but doesn't know me from Adam. My name is Sheila. I hate it, always got called She-ra as a kid. It sounds like an old name lol! I already follow you on facebook! Sheila H.
Surely "Jamie" has moved solidly into the either/or name category at this point (at least in the U.S.)!!? I think it shares an apartment with Leslie. That is so cool that you have your own personalized blue weapons. I hate pink. And kittens. I'm cool with it; it's short, easy to say, easy to spell. The only irritating thing is that often when I'm introducing myself to someone, and I say, "Hi, I'm Lisa," the other person will hear "Melissa." So I often end up having to introduce myself twice. Alas, I do not have a Facebook account. My name is Rebecca....but you can call me Becca if you want to. :-) I like my name okay. But do NOT call me Becky or I might hit you. That's all! I think I already "liked" you on Facebook, but I clicked it again. My name is Wendy and I have no problem with it. Except with my southern accent people think I am saying Winnie. I've always liked my name ok, but I would have preferred a name with a vowel on the end! My name is Heather. I do like my name! Although not very original for my age range. My name is Mary, rather plain. But my husband's name is Kelly and he's always getting mail addressed to Ms. Kelly Ward. My name is Laura C.
My name is Karla. I didn't like it when I was young but I do now. My grandmother's name was Addie and my dad's name was Leonard, so I ended up with the middle name Adelen. I hated it as a kid because it was "weird", but I've grown to love the specialness of it. My name is Ellen. I was named after an aunt who passed away very young. Thanks for the chance. My name is Kaye. I hated it as a child because it wasn't trendy. I don't mind so much now. However, I usually have people misspell it by leaving the "e" off the end. Thanks, Mom & Dad for that one. My name is Amanda. I used to not like it because it was very popular. My name is debbie. Nothing fancy, just average. Now my sister, I got to name, and I named her after my dog. My name is Katia. I love it and hate it. Love it because it's unique and it means "pure" in greek. Hate it because no one knows how to pronounce it and I've heard every pronunciation under the sun. My name is Robert - I'm ambivalent, doesn't really mean anything or matter that much to me. My name is Mary. I think it's too plain. My name is Sharon. I guess it is kind of an old-fashioned name these days, but I always liked it. awesome giveaway!! My name is Linda. My cousin named me when I first moved to this country. I like to sign it with a "y" (Lynda) to set myself apart. I personally never think of Jamie as a boys name, my cousin (girl) was named Jamie, so I usually think of a girl! :) My name is Amber, not really something you can confuse a boy with, none that I've ever met at least ;) Thanks for the lovely giveaway! So many times throughout school did I always get variations of it, most of which are male, such as Luis or Louis. Heck, this past summer I took a summer class (and one would think that I would have remembered why I didn't like taking science college classes in the summer because even if the class isn't tough, the schedule is!) and the very Russian teacher there said one day, we have two Luis's in the class. NOOOOOO, we don't!!! Luis is Luis, Lois is like Lois Lane. :P LOL Okay, sometimes this subject drives me nuts. But it truly is amazing to find out in my neck of the woods over the years that there are people who have never heard of Lois Lane from Superman. And no, I wasn't named after Lois Lane, but a cousin. And this one neighbor somehow got Laura from Lois when he was stoned. Not really sure how. But when he called me Lois, knew he wasn't on anything at that moment. Sigh. Crazy world, isn't it? My name is Marilyn. I was named after Marilyn Monroe. Unfortunatly I do not look like she did! My middle name is Luan. I hated it my entire life and would get mad if any of my good friends told anybody what it was. Today I am proud of Luan -- I loved both my grandmothers dearly - One was Louise and the other Annie - put them both together and you get Luan! I think of them everytime I say my own name! p.s. I follow you everywhere! My name is Amber and I rather love it! It's short and easy to spell, though not worth many points in Scrabble. My daddy named me Linda which means beautiful in Spanish. I like it because you dont heard of too many other Linda's! My name is Kimberly. Not sure why I was named that, but I've always like it. My name is Nate, and it means I am awesome! My name is Brandy, and I don't like it very much. It sounds like a stripper name, lol...My mom picked my name, Brandy Leigh, because of a song by Golden Earring called Radar Love. One line says Brenda Lee coming on strong...My mom mistook it for Brandy Leigh, and here I am 29 years later, a stripper name without the stripper body. I have a 7 month old and am 18 weeks pregnant again! PS-entry 61 is mine, but I forgot to put my e-mail addy in! My name is Ashley. I was named after a character on The Young and the Restless. I don't care for it because it is soooo common. My name is Mari. I have always like it, but it is not often pronounced properly. I kinda wished I had been named May-ree, which is how it is said. My name is Rebecca, not Becky ever. I like the name. My name is Denise and I don't like it, so call me Dee. My name is Patricia and I got this name because both my grandmothers wanted me named after them and my mother knew if she chose one of them..well, doesnt that say it all so she named me after herself. My name is David, because my mother named me after David from the Bible, which is a very weird decision, since I consider myself not as redeemable as the latter from the Bible. I always preferred the names Sidney, and Ridley. My name was not nearly as common 38 years ago as it is today. In fact "Meredith" was actually the maiden name of one of my aunts. (Wonder if there's any relation to Don Meredith?) Anyway, my mom liked the name so there ya go. My middle name, Ann, came from another aunt. Yes that would be my Aunt Ann. Oh ... and I already follow the rabbit on Twitter. And "like" the bunny on Facebook too. My name is Carol. It was extremely popular around the time I was born, so there was nothing unique about it at all. My name is Linda, it was a pretty popular name then, I really never disliked my name. 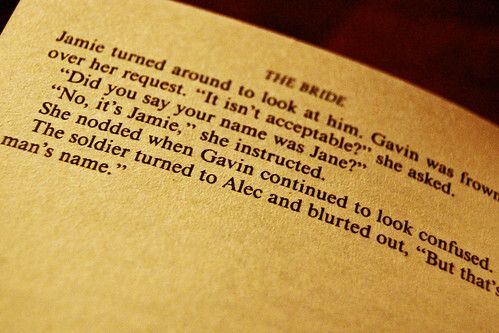 I love the name Jamie! My niece is named this and I think it's really cute. Now my name on the other hand is Margaret...I was named after my Grandmother and I really feel that this is an "old persons" name. Never liked it. For short everyone calls me Peggy, which is ok, but not that great. My name is "Theron". I like it as it means BEAST. Similar to Aleister Crowley's chosen name of "Therion". A variant of my name. My name is Kiara.I love my name! My name is Deborah, an old Hebrew name meaning "bee". I like it all right, it's better than many of the popular names now, in my opinion. My name is Shannon... which could go either way, boy or girl. In fact, growing up, I came across more BOYS named "Shannon" than girls! My name is Kimberly. I like it now. When I was younger I would go by Kim, but now I appreciate it more and like Kimberly. I Like" Jamie's Rabbits on Facebook. I'm a follower of Jamie's Rabbits on Twitter. My name is Ellie and I hated it while growing up. I thought it was so old fashioned. But it has grown on me and grown in popularity lately. "Liked" Jamie's Rabbits on Facebook. My name is Egle, mythological Queen of Seprents in Baltic folklore. But in America people keep calling me Eagle, which I feel is not very cute name for a girl. My name is Betty which isn't so common any more. By late high school I wished it had been Elizabeth which lends itself to several nicknames. My name is Darcy. I like it because it's unusual, but my mail is often addressed to Mr. D'Arcy. I hate that. At least I know it's junk mail and I can toss it! My name is Lynda and in Spanish Linda with an I means pretty or beautiful, however, my mom likes to spell it with a Y instead of I on paper. I like anyhow. My name is Renee. I like it, but people find plenty of ways to misspell it. My name is Chelsei. It's and alright name. I haven't met that many people with the same name and no one spelled the same way. I like Jamie's Rabbits on FB. My name is Samantha. It means listener. I think it fits and not just because of my pesky eavesdropping habit. I love Jamie's Rabbits on FB. My name is Monica, my sister who is 4 years older then me named me. My name is freepartner, not bad right? Very unique last name and it is hard to forget! I'm Jessie, I'm ok with it. Merle, and yes it's a guy's name. and it means blackbird. groan. My name is Gina... it means queenly. I like it! My name is Melissa. Was that book by Julie Garwood? I recognize it...love love love her books. Anyway Melissa means honey bee. It is from Greek mythology. My name is Davney & it is ALWAYS spelled/pronounced wrong. My name is April. My father and grandfather were born in April. It sucked so much as a kid, that my mom would let me stay home from school on April fool's day. Now, it is just a name. My name is Alexandria. Pretty and not many people have it, but Its soooo long. I couldn't get it on my class ring because it was one letter too long. So not fair. My name is Nadine, which means Hope. I like it because it's different, I think I have only met 2 others with the same name in my life. My mom picked it because she lost a baby just before she became pregnant with me and thought she was never going to have more. I became her hope that the Dr.s were wrong, and they were, not only did I make it, I have a brother and sister as well. My name is Elizabeth and I love it. I do not like to be called "Liz" or "Beth"
It's Jessica. Dad ended up naming me and I like it more than Mom's choice-Czara. The only problem was that there were three Jessicas in my class, and I was in a small town. Still better than Czara. My name is Rachel, my dad named me while my mom was still unconscious from the c-section. It is probably a good thing because my mom wanted to name me Paisley. My name is Sharon and I've never really liked it much. It seems too strong of a female name. Never liked my name much, Amanda. Used to always get called A-man-duh, nice huh. Though my middle name is Starr which is much better (after the outlaw Belle Starr) but for some reason have never used it as my "regular" name. My husband also has a very common name, John...actually John Adams so the jokes never end. So we decided to to go a bit crazy and name our daughter Phoenix Starr Blu. Now she is six she always tells everyone proudly she was named after both the mythical bird and the lady from X-Men but not the place haha...hopefully she'll still like it when she is older. I am Rachel,and I like it.It's common but not too common and its just a nice old fashion name. My mom named me after some great great grandmother just because it was a nice family name. From one androgynous name to another- I feel your pain! That's really funny, because the only Jamie I know IRL is a female, so I've always thought of it as a girl's name. My name is Maria, and I like it because it's mainstream yet not overused. What I don't like about it is how everyone and their mother feels compelled to sing West Side Story or the Sound of Music at me whenever they see me. How annoying! Stephanie is my name. I like it well enough! I sometimes wish I had a more exotic sounding and less common name but I am sure I would get tired of the mispronunciations! My name is Heidi. I think my parents just liked the name. My name is Shirley and I was named after an aunt, I like it. Mine is Monique Oh la la. middle name is even worse, Agnes. I like my name Jeff because it sounds peaceful. My name is Tari. I didn't like it growing up because I could never get any of that cute personalized jewelry that was popular then. As a adult I have come to appreciate the uniqueness of my name. My name is Kelly which is also sometimes a boy name! Name is Kim. I was named after the movie "Kim". I have always liked my name. Short, simple, and me. My name's Halley. I was named after my great-grandmother Helen. I've never really loved my name, but after much brainstorming I've never thought of a name I think would suit me more, so I guess I have to be satisfied! My name is Juliana, I like it! I like my middle name better than my first name. It is Joy, and since I tend to be a fairly joyful person, it is fitting. My name is Alex. I don't hate my name but it's nothing special either.